The weather is finally cooling off and the days are getting shorter. One of the things I love on a crisp fall night is “breakfast for dinner”. Some nights, I dig out the cast iron pan for pancakes and bacon and other nights I will shred potatoes for a cheesy potato and sausage frittata. Last night, I wanted something different and savory for dinner. 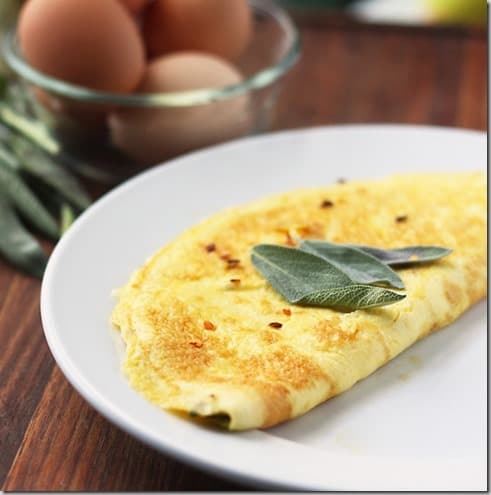 I used my trusty Cooking Light bookmark and found this cheesy omelet with a kick. I had all the ingredients already on hand. I just needed to make it and EAT IT! If you do not like a lot of heat, feel free to leave out or decrease the amount of red pepper flakes. Combine first 6 ingredients in a bowl, stirring gently with a whisk. Heat an 8-inch nonstick skillet over medium-high heat. Add 1 1/2 teaspoons oil to pan; swirl to coat. Add half of egg mixture to pan, and spread evenly in pan. Cook the egg mixture until edges begin to set (about 1 minute). Slide front edge of spatula between edge of omelet and pan. Gently lift edge of omelet, tilting pan to allow some uncooked egg mixture to come in contact with pan. Repeat procedure on opposite edge of omelet. Continue cooking until center is just set (about 2 minutes). Sprinkle half of cheese evenly over half of omelet. Loosen omelet with a spatula, and fold in half. Carefully slide omelet onto a plate. Repeat the procedure with remaining oil, egg mixture, and cheese. Garnish with sage leaves, if desired. Serve immediately.